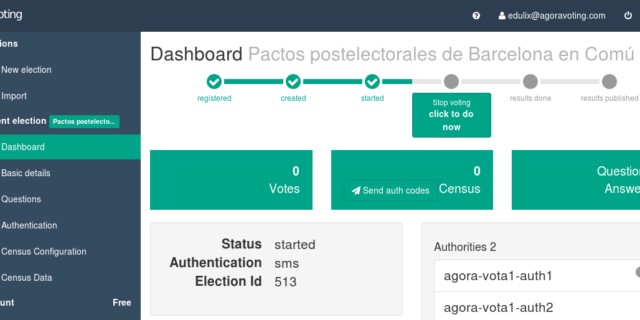 Agora Voting is a secure open source online voting software that protects the privacy of the vote and makes elections end-to-end verifiable. This tool has been developped within the D-CENT (Decentralised Citizens ENgagement Technologies) project, co-funded by the European Commission. D-CENT is a project that brings together citizen-led organizations that have transformed democracy in the past years, and helps them in developing the next generation of open source, distributed and privacy-aware tools for direct democracy and economic development. Agora Voting allows organizations to carry out secure, flexible and transparent elections online. Votes are encrypted by the voter’s web browser and are kept private from even the election administrators. It has been used in multiple elections in Spain, including by political parties such as Podemos to do internal binding elections. multiple options for checking the authenticity of voters, e.g. via codes delivered by post, ID card recognition, one-time SMS/email password codes. Secure private voting: ballots are encrypted in the web browser. users can vote from laptop, tablet or mobile device. IULVA-CA open primaries / July 2014: In July 2014 Izquierda Unida Andalucía chooses his candidate for the next elections using an open primaries. In this case, a mixed voting system using AgoraVoting and in-person voting was used. Referendum Real Ya! 2014: After the abdication of King Juan Carlos I in Spain, different groups of people interested in public consultation came together to collaborate on a citizen referendum which was supported by this software. Transparent Congress 1, September 2013: This congress was a pilot implementation of direct democracy in the spanish congress, related to the transparency law voting. The congressman promised to vote and support the result of electronic voting done with AgoraVoting. Transparent Congress 2, December 2013: The same experience was repeated in December to vote the energetic reform.